Update: Looks like Air Canada Vacations has added another one of those crazy cheap flights to St. Thomas, U.S. Virgin Islands for $126 roundtrip after taxes. Follow the instructions below but use March 31 to April 7 as your travel dates. There are some insane last minute deals through AirCanadaVacations.com going on right now - There's a flight from Montreal to St. Thomas, U.S. Virgin Islands for $126 roundtrip after taxes!! It's a bit of a milk run and requires an overnight stay in Toronto on the way back, so be aware. 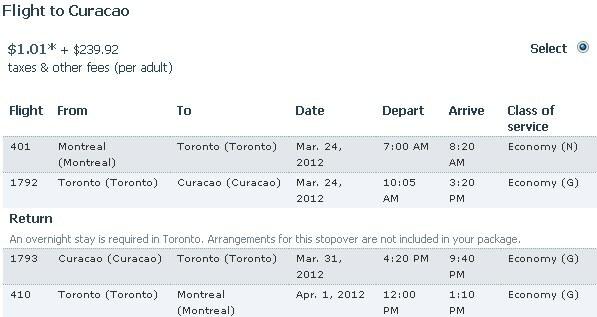 And now let's move on to Curacao, for $240 roundtrip after taxes! Search for a flight from Montreal to Curacao, departing March 24 and returning March 31 OR departing March 31 and returning March 7. Also requires an overnight stay in Toronto on the way back. And then there's Liberia, Costa Rica for $256 roundtrip after taxes!! Search for a flight from Montreal to Liberia, departing March 19 and returning 1 or 2 weeks later. Search for a flight from Montreal to Saint Lucia, departing March 19 and returning March 26.
montreal, yul, flight deals, caribbean, central america, costa rica, liberia, lir, air canada vacations, saint lucia, uvf, eastern caribbean, southern caribbean, st thomas, us virgin islands, willemstad, curacao, netherlands antilles and cur. 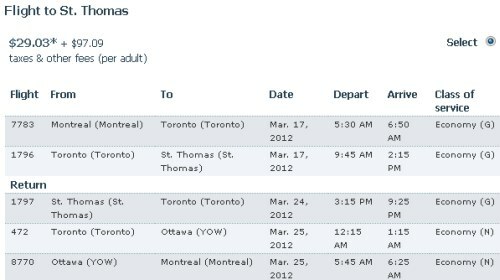 No Responses to "Montreal to St. Thomas U.S. Virgin Islands - $126 roundtrip after taxes!! And insane prices to Curacao, Costa Rica, and St. Lucia too!"